Lately I feel everyone around me has caught some sort of "bug" With the flu season in full swing I am doing EVERYTHING possible to avoid getting sick!!! Eric introduced his mom and me to wheat grass shots, and holy cow if y'all haven't tried it yet, and aren't wanting to catch even a cold, do it now!!! His boss gets one every night after work, and swears by it saying that he hasn't had a cold in years!! I've tried it a couple times now, and have noticed a difference even in my energy level! So basically what they do is take the wheat grass which is all organically grown and squeeze out all the juices from it. They put it in a tiny little cup for you to drink. It smells a lot worse than it tastes. I mean it smells like grass lol which is kind intimidating right before you throw it back, but it doesn't have a super strong taste or anything crazy. Just drink some water after to get rid of the after taste ;) Try it I dare you... I think a few of you might actually become addicted! They say you're supposed to start with one oz. and then gradually over time work your way up to 6oz. Do a shot 2-3 times a week for best results. I went to Smoothie King (for those in the south), but I'm sure Jamba Juice has it too. 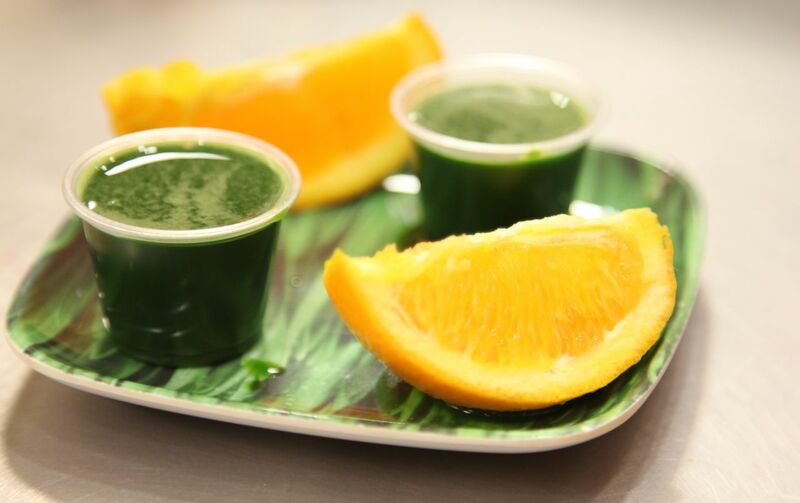 My little shot of fresh wheatgrass!!! Eric taking a pic with the celebrity of the day!!! I would have sat on the pony, but I din't want to break it!!! I hope everyone has a great Tuesday, and stays healthy!!! NO FLU!!! P.S. Keep an eye out for the giveaway tomorrow!! My very first one, and you won't want to miss it! !